This is my personalized mood chart. You can find a larger and clearer image here. It was inspired by the one my mental health insurance provider sent me when I began taking mood stabilizers. Last week I described how their chart works and how people with mood disorders benefit from using any of the great variety out there. 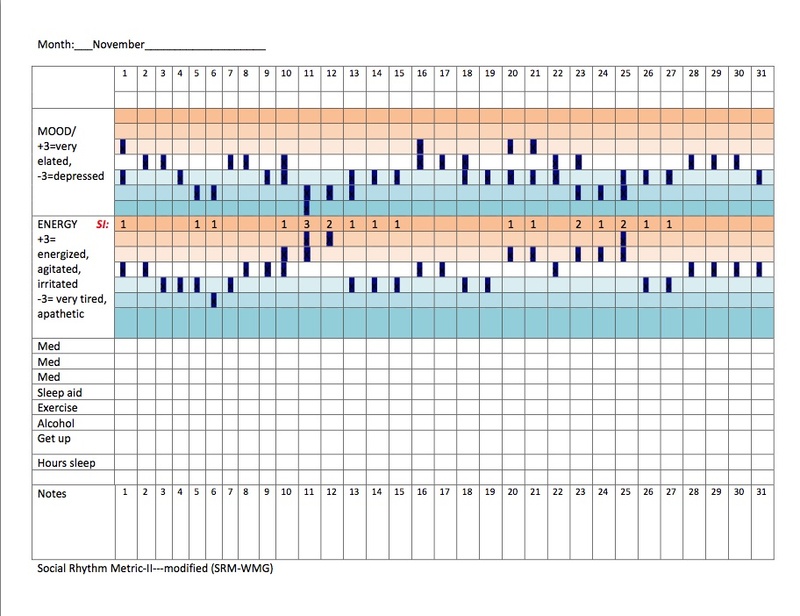 Cigna's chart primarily tracks mood. Using theirs, I learned that lamotrigine made a difference to the course of my symptoms. After years of inappropriate prescriptions of antidepressants, I had moved to rapid cycling. No, rapid cycling means several cycles in a year. More like, I was spinning, from the depths of depression to raging agitation within each week, week after week. Lamotrigine did modify that pattern. It stretched the cycles, down from four to two a month. By recording the pattern, eventually I concluded, and I had the evidence to support it to my doctor, that the costs of the medication (dizziness, fourteen hours of sleep and grogginess a day, losing words) outweighed the benefits. But Cigna's chart was missing vital information. Mood disregulation was only part of my experience. It was the agitation, sense of urgency, poor concentration, lack of sleep that put me on the disability roles. And, I began to suspect, these disturbances in energy levels were driving my suicidal thoughts as much as my depression was. So I set about to document that pattern. I added the section that charted the energy pattern, assigning apathy, fatigue, lack of motivation to the blue zone, and anxiety, agitation, irritation, desperation to the pink zone. Well, it's more salmon than pink. But I don't have OCD and after I noticed, I didn't go back to fix the color. Then I penciled in SI, for suicidal ideation, on the top pink line in the energy section. Each night I recorded a 1 for intrusive thoughts of self-harm, more than the habituated gnat that could be batted away; 2 for when I found myself pushing back a desire to kill myself; 3 for when I was rehearsing my plan. Here is a sample of my results. It turns out my own suspicions were confirmed, that when my mood was lower and my energy higher, the level of my suicidal symptoms increased. I call it the danger zone, when the two lines tracking mood and energy approach each other. A little research uncovered the information that this pattern is not unique to me. People having mixed episodes are at the greatest risk for suicide. Again, I had data to give to my doctor. In place of the unsuccessful chemistry experiment with a mood stabilizer (well, it was successful, because it yielded information that we used to decide to discontinue), we shifted tactics. The anxiety became the priority. During the next rounds with several other meds, I used the notes section to record side effects, which, again, helped us make prescribing decisions. In the DSM, anxiety is not a part of mania and hypomania; it is a separate disorder. In the real world, more than half of those diagnosed with bipolar also have an anxiety disorder. And those with both (called comorbidity) have increased numbers of both depressive and manic/hypomanic episodes, suicidal ideation and actions, and hospitalizations, compared to those with simple bipolar. So even if we never found a magic pill for the bipolar part, there was still enormous reason to address the anxiety part. The DSM does not diagnose on the basis of what is going on inside the brain, but rather on outward manifestations. Its approach to the data above would be to consider the possibility of a particular subtype of bipolar. This would make a difference if it directed researchers to investigate what is happening inside the brains of people with this subtype of bipolar, leading to treatments designed specifically for it, rather than treating the bipolar and anxiety as two separate issues, piling on more meds. In the real world, the labels are useful only to the extent that they give patients a language that our psychiatrists can understand. Experientially, anxiety feels like a power surge. So does rage, pressured speech, flight of ideas, hyperactivity. There are distinctions to be made among these symptoms. But the excess energy, focussed or not, in whatever direction, is the common foundation. That is why I did not bother to separate them on my chart. Maybe later I will find a reason to tease out the differences in these symptoms, and adapt my chart to learn more about what exacerbates each, and what helps. 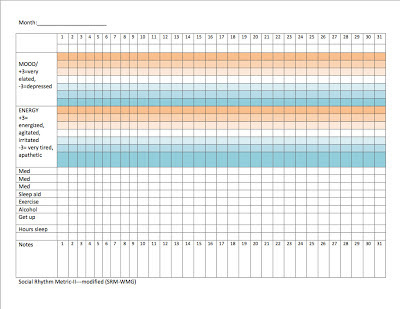 Medication management was only my initial purpose in using this chart. The people with bipolar who do best are those who are well informed about the disorder, pay exquisite attention to shifts in symptoms and make early interventions, well before others notice an increase in symptoms. I believe the energy variations, along with amount of sleep, are the most sensitive early warning system. My chart became my most valuable tool for learning, paying attention and supporting healthy practices. Does my alcohol use make a difference to mood or sleep? For a month I recorded amount and time of day. A half a beer at noon was insignificant. On the other hand, a martini at bedtime interfered with sleep, and made me depressed the next day. What about exercise? It increases my energy, which is a good thing when simple depressive symptoms are my issue. But a brisk walk does not relieve my anxiety once I am in its grip -- which has to do with my triggers. Generally, exercise does relieve anxiety. These things are individual. My chart tells me my pattern. 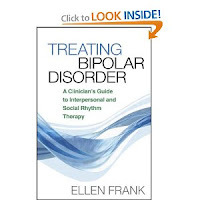 Then a friend introduced me to Ellen Frank's Social Zeitgeber Theory of bipolar - that bipolar is, biologically, a disturbance of circadian rhythms. Her book, Treating Bipolar Disorder describes the practice of Interpersonal Social Rhythms Therapy, IPSRT. I reviewed this material over four posts in Prozac Monologues. This last post in the series has links to the first three. The down and dirty version of the therapy: Maintain a regular schedule; get up the same time of day; follow a routine about when you leave the house, see people, have meals, go to bed. Plus deal with whatever issues prevent you from keeping that schedule. IPSRT is an evidence-based treatment. They have done the research -- it improves outcomes. There is no therapist trained by Frank in my area. So I am on my own. Sleep has been a huge issue at various times in my sojourn in this wilderness, and sleep difficulties clearly linked to suicidality. 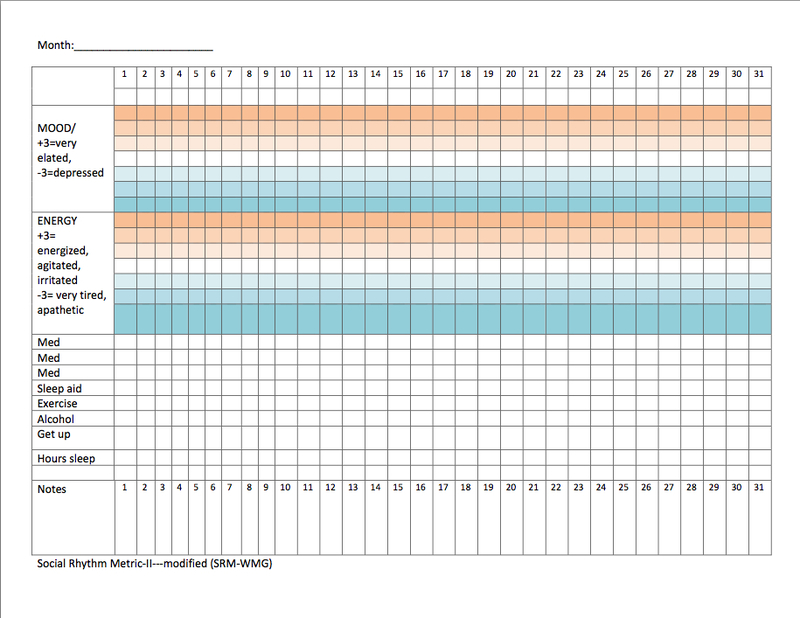 Inspired by Frank's work and chart, I decided to start by recording what time I get out of bed in the morning, aiming to make that within the same 30 minute window daily, and let the forced early rising set the rest of the schedule, including when I went to bed. Here is that chart again, so you can see where this data is recorded toward the bottom. Get up is the line where I recorded the hour I rose. Is there a pattern to the time of day that I get anxious? What difference does sugar consumption make? What about the amount of time I spend on Facebook? I can cross off alcohol and substitute sugar on my chart, or put Facebook in the empty line at the bottom to get the data on my new questions. You are welcome to capture the image and print it for yourself. You may want to create your own version. I made mine using a table from Microsoft Word. If you ask, I'll email you a copy that you can then modify to track the data most important to you. 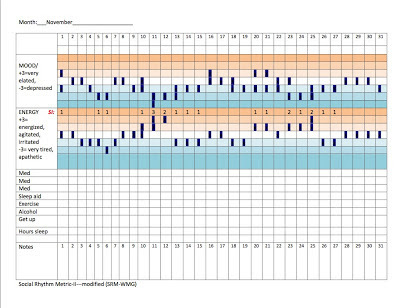 I am curious about your experience with charts, and hope you add comments. Remember, we're all in this together.